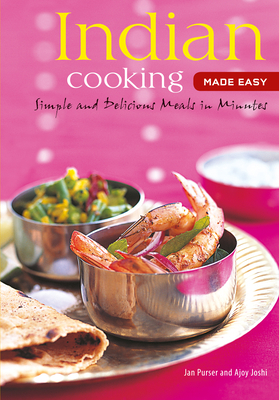 Indian Cooking Made Easy presents a collection of authentic, yet easy-to-prepare dishes from all over India--from tasty appetizers and snacks to vegetarian entrees to traditional chicken and lamb dishes. Ranging from the basic spice mixes that give Indian cooking its distinctive flavors and aroma, to crisp and light dosai from southern India, to the creamy homemade ice cream called kulfi, the dishes are superb either on their own or when served together as a traditional thali-style meal. Recipes for chappatis, paratha, yogurt-based raitas, pickles and chutneys, are also included, which will complement any Indian meal. Even beginner chefs will be able to follow the recipes and flavors in this book easily. Cooking Indian food, like any other great cuisine is a celebration of life. Preparing the food is as much of an experience as eating it. Jan Purser is a nutrition editor and consultant, remedial therapist, meditation teacher and freelance writer. Ajoy Joshi lives in Sydney, Australia, and is the chef and co-owner of Nilgiri's Restaurant and Nilgiri's@Home.